Art Star is a gallery & boutique located in Northern Liberties, Philadelphia. We carry handmade items & products by artists throughout the country, as well as a handful of international artists. We also work closely with select artists to design & develop limited edition products. Our goal is to offer well crafted items at a full range of prices to accommodate everyone’s budget. 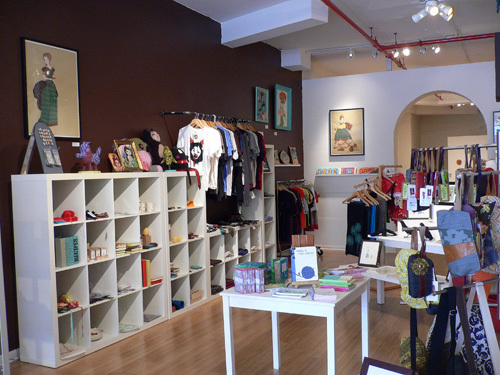 We currently work w/ 50+ artists & stock everything from one-of-a-kind pieces to housewares, prints, jewelry, clothing & more. In addition to our brick-and-mortar shop, we also put on Philadelphia’s largest outdoor craft fair – the Art Star Craft Bazaar, which won Philadelphia Magazine’s Best of Philly Award for Best Shopping Event in 2010. Erin Waxman graduated from Tyler School of Art in 1999 with a B.F.A. in Jewelry, Metalsmithing, and CAD-CAM. After graduation she developed a small production line of hand made jewelry & clothing. She began selling her work at local craft shows and in small boutiques in the area. After finding that there were limited venues in Philadelphia for emerging artists, she started the Art Star Craft Bazaar. The series of craft shows were a success and she decided to open up Art Star with Megan Brewster in November of 2004. Megan Brewster graduated from Tyler School of Art in 2000, with a B.F.A. in Ceramics. After graduation she helped run the gallery at The Clay Studio in the Old City section of Philadelphia. She continued to develop her own work on the side, but found it frustrating and difficult to do so without adequate studio space. She also found that there were limited venues in Philadelphia for the type of work that she was creating. She joined forces with Erin Waxman & began selling her work at a series of local craft shows that they had developed. In 2004, the two decided to open up their own gallery & boutique, Art Star.